How many of you want to spend the next 20 years under similar or worse bullies after the next election? I don't. I hope you don't either. But that is precisely what is going to happen if PBA hothead and provocateur Pat Lynch has his way. He has groomed anti-de Blasio sentiment in this city with stunning expertise. Luckily, I do believe that a backlash is beginning. Many people are not happy that the police disrespected the funeral of Officer Liu by turning their backs on the mayor yet again. And I can't imagine that too many people are thrilled about the de facto police work slowdown. Speaking of which, while not getting tickets may seem nice, refusing to make arrests is beyond the pale. When someone is inevitably murdered, raped, or robbed because the police refuse to so their jobs, will Pat Lynch have blood on his hands? And where is Mulgrew in all this? Let's not forget that Mulgrew endorsed Thompson for mayor, not de Blasio. Yet our mayor did not turn his back on teachers. He continued to fight, and still is fighting, against charter schools in this city. He succeeded in establishing universal Pre-K, which may yet turn into the greatest education boost for underprivileged kids this city has seen. He settled a contract with us quickly, which will give us the raises and retro money we deserve. (For the record, I voted against the contract due to the ATR issue, but that is something Mulgrew apparently agreed to.) He put a much more teacher-friendly chancellor in place--and while I do not by any means think Carmen Farina is the best choice, she is light years better than Joel Klein or Cathie Black. Don't kid yourselves--if Pat Lynch triumphs in his crusade against the mayor, de Blasio will not be succeeded by a teacher-friendly Democrat. His successor would almost certainly be a right wing, pro-charter republican, or worse still, a faux Democrat like....dare I say it? How does Mayor Moskowitz sit with all you UFT members? So the question remains--why has Mulgrew turned his back on a mayor who has had his back for the last year? Mulgrew doesn't have to oppose the PBA to do this. He needs to show his support for de Blasio with public appearances and praise for this mayor. He needs photo ops shaking the mayor's hand, and a new initiative or two that will help change the perception that the mayor has lost union support. And make no mistake, that is the public perception, because not a single union chief has come out in support of this mayor since Pat Lynch seized control of the narrative. If he keeps turning his back on this mayor, he may turn around in three years to see Eva Moskowitz staring him in the face. Sorry, but there is no attack on cops. Who, exactly, is attacking them? Are they being put in rubber rooms? Unfairly evaluated? Threatened with layoffs? Having their seniority taken away? Having their pensions questioned? Is someone trying to privatize the police department? Is there a "Cops for America" corps taking jobs? Lynch will not get a better contract for the cops because they are in binding arbitration and PERB always goes with the pattern. Lynch is grandstanding because he is running for PBA head again. As far as I am concerned, you don't stand up for your members by disrespecting fallen comrades at their funerals, and you don't use those deaths for political gain. As for not seeing Moskowitz as mayor, I don't think many people believed that Bloomberg would get a third term, either, but he did. I didn't see it as disrespecting the fallen police officers----I saw it as disrespecting the mayor. If Bloomberg had shown up at my funeral I would have smiled from above as my friends and family dragged him from the church. We'll know soon enough how good or bad the cops' contract is----then we can opine on whether Lynch's tactics bore fruit. 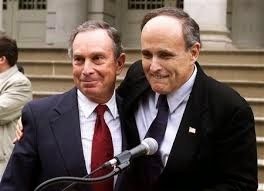 Of course Bloomberg was a creep. However, as the poster above mentioned, there is indeed a push against police officers and their "cushy" jobs. Today in the New York Post there is an editorial detailing how Cuomo is trying to push mayoral control over police disciplinary cases instead of arbitrators. The article actually compares the need to oversee cops and teachers in the same way. We all know this is just deform talk for more destruction of both these profession. I suppose if De Blasio had not insinuated that cops were racist while relating a conversation he had with his son then the cops would not have reacted so strongly. That is in addition to his encouragement of the ill-conceived and out-of-hand protests that devolved into anti-police chants (to say the least). That is in addition to the fact that some cops see his encouragement of anti-police protests as a contributing factor in the assassination of two NYPD police officers. He has yet to apologize. If De Blasio insinuated that public school teachers were pedophiles I would hope all teachers would turn their backs on him (at the very least). And we would wait for an apology. Anon 9:29, it seems as if you want to blame de Blasio for everything. I have two girls, and when they entered pre-school we definitely told them to report to us if anyone touched them inappropriately. As for the protests, what would you have had the mayor do? Take away the first amendment right to free speech and assembly? NOTHING, and I repeat NOTHING, that the mayor said led to those police killings. It was the act of a random psychopath with a long history of violence and crime. Does race play a factor in policing? Just compare marijuana arrests and how police treat white and black offenders. We know that as many if not more white kids smoke grass. I heard George Pelicano on NPR last night - he helped write The wire - when he was stopped by cops they asked where he lived and sent him home - and he was a pretty bad kid. He compared that with what they did under the same circumstances with kids of color. We can't deny that race plays a role and the excuse is that they have to do this in high crime areas. I pass so many cars stopped with black drivers - maybe a black person driving a nice car causes automatic suspicion? I know all too many white people who will say pulling over any black driver of a nice car is perfectly justified.